White sandy beaches, good food and wine. These are mostly the main reasons why people visit Sardinia, the second largest island of Italy. There are sooo many beautiful things on the Sardinian island to explore. One of the main highlights is the food. Today I am going to take you closer and show you a piece of traditional Sardinian cuisine. 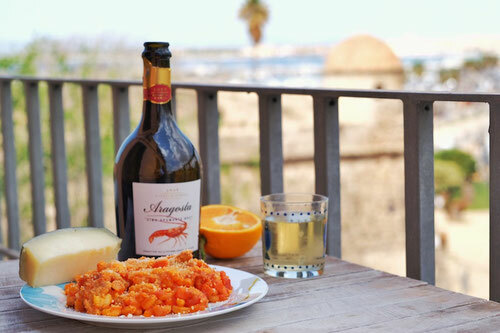 Gnocchetti Sardi - Little Dumplings from the precious island Sardinia. This time I have the ultimate chance to cook my favourite recipe in the old harbour of one of the Most beautiful Cities on the whole Island - ALGHERO. 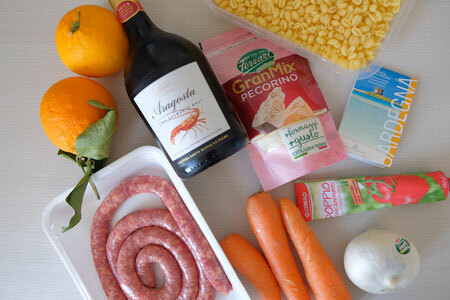 This recipe is surely easy to prepare and you if you find yourself in Italy, the ingredients are very inexpensive. This colourful and intensely flavourful dish is very popular and is considered to be a signature dish in Sardinia. If you visit a restaurant in Sardinia, it is most likely that you will get "Malloreddus" as a "primo piatto" as first dish following a meat or fish - assumpted you ordered a "Menu Degustazione" which is quite common on the island in many restaurants. You can choose from variations of different menus prepared to order. Mostly cooked from local ingredients. Yumm! 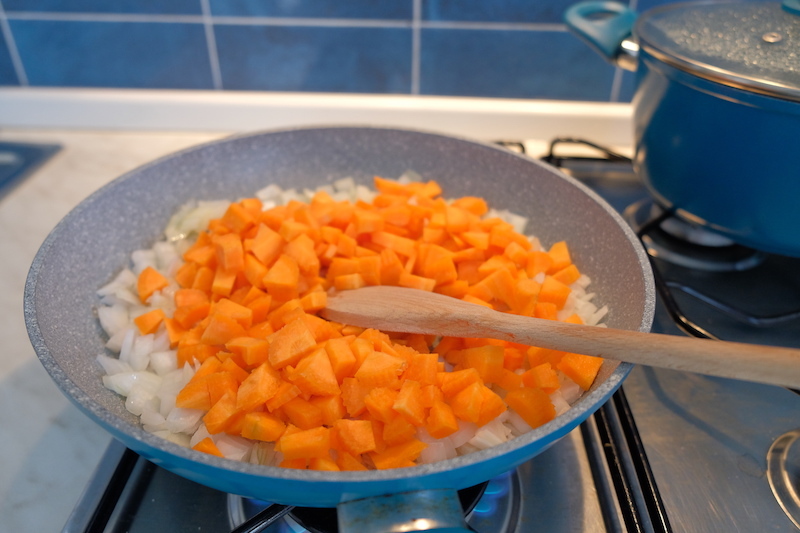 After chopping up the carrots, celery and onion, heat up a large frying pan and add those ingredients to the pan. Fry for few minutes until the onion gets nice and glossy. Then season with salt (additionaly you can also add rosemary). 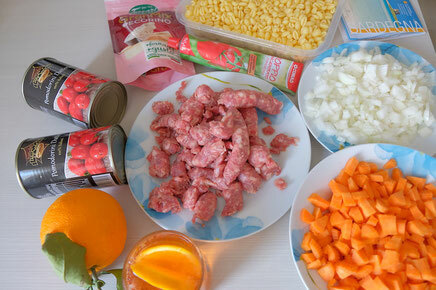 First remove the salsiccia from its casing and then add to the pan with your vegetables. Break up the sausage in a pan and let it to sauté for 5 minutes. After that add a splash of wine. Stir and let the wine to evaporate. 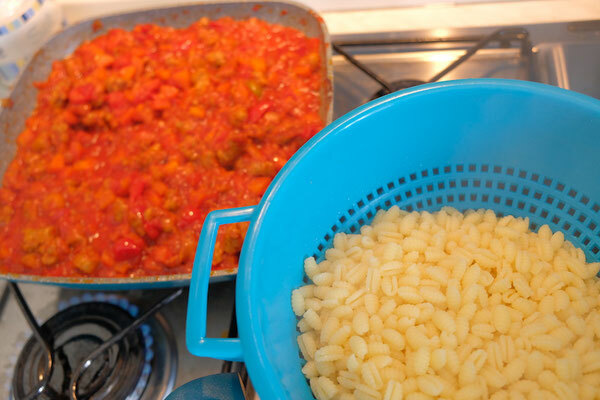 Now add the canned tomatoes and tomato pureé. Let to simmer for 5 minutes. Pour in 200 ml of water. Bring to the boil and after reducing the heat let to simmer for another 15-20minutes. Season with pepper and salt if needed. Mind the cooking time on your package as it depends if the pasta is freshly made or dry. 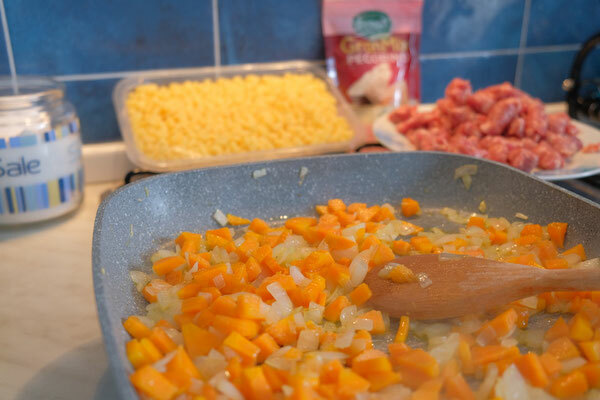 You will only need about 2 minutes for cooking the pasta if you have a home-made or fresh one from the shop. Drain the pasta well before adding to the ragú sauce. Generously add the pecorino cheese to the mixture and stir. 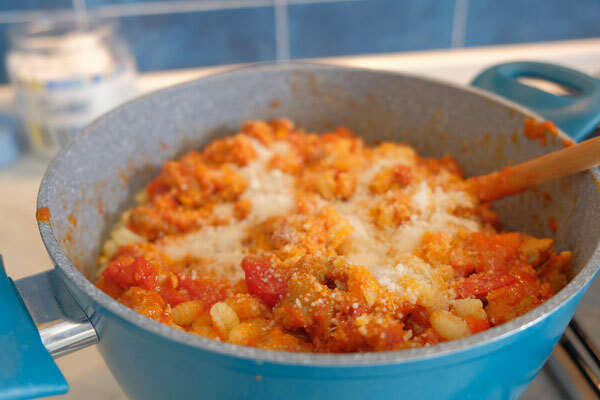 Transfer your ready Gnocchetti Sardi onto a plate. Sprinkle with more Pecorino cheese. If you like you can add basil on the top.